Welcome to the latest issue of the Inclusive Growth Bulletin, covering South-South learning on innovative poverty-reduction strategies. This issue introduces readers to new publications covering such topics as the effects of Brazil's tax structure on the country’s income inequality, new entries in the ongoing series of One Pagers focusing on non-contributory social protection programmes in countries of the Middle East and North Africa (MENA) region, and the importance of data and information integration management systems for social protection. In addition, you can find out about the IPC-IG's latest activities and participation in events worldwide. 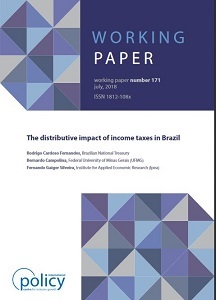 In the Working Paper "The distributive impact of income taxes in Brazil", the authors Rodrigo Cardoso Fernandes (Brazilian National Treasury), Bernardo Campolina (Federal University of Minas Gerais - UFMG) and Fernando Gaiger Silveira (Institute for Applied Economic Research -Ipea) study the effects of the Brazilian tax structure on income inequality. They demonstrate the regressive character of taxation in the country—as most of the burden is concentrated on indirect taxes on consumption, to the detriment of direct taxes on income and property. This past April, the IPC-IG and the UNICEF Middle East and North Africa Regional Office (MENARO) presented the "Overview of non-contributory social protection programmes in the Middle East and North Africa (MENA) region though a child and equity lens". 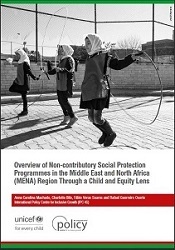 This report, prepared by Anna Carolina Machado, Charlotte Bilo, Fábio Veras Soares and Rafael Guerreiro Osorio (IPC-IG), assesses the state of child-sensitive design features of non-contributory social protection schemes in the MENA region, focusing on 185 programmes implemented and at least partially financed by national governments, across 20 countries. The study has been among the top downloaded publications on our website for the past three months. Since its launch, the Centre has released the Executive Summary of the study in Arabic, English, and French. Additionally, under the scope of this project, the IPC-IG has been publishing a series of One Pagers, from May through December, featuring each of the 20 countries mapped and their child-sensitive social protection programmes. This month we bring you a new batch of three: Jordan (Arabic, English, French and Portuguese); Kuwait (Arabic, English, French and Portuguese), and Lebanon (Arabic, English, French and Portuguese). Previously released One Pagers in this series include: Algeria (Arabic, English, French and Portuguese); Bahrain (Arabic, English, French and Portuguese); Djibouti (Arabic, English, French and Portuguese); Egypt (Arabic, English, French and Portuguese); Iran (Arabic, English, French and Portuguese), and Iraq (Arabic, English, French and Portuguese). In the One Pager “Integrating data and information management for social protection: social registries and integrated beneficiary registries”, Valentina Barca (Oxford Policy Management) explains how the development of a social protection information system can ensure a more equitable, responsive and inclusive distribution of resources, and increase the efficiency and effectiveness of service delivery. The One Pager also discusses some of the challenges and risks involved. This publication is available in English, French, Portuguese and Spanish. 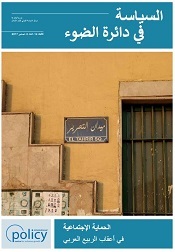 We are also glad to inform that the Policy in Focus issue titled "Social Protection after the Arab Spring" is now available for download in Arabic, in .PDF, following its publication in English and French. Featuring specialist guest editors Rafael Osorio and Fábio Veras (IPC-IG), this issue gathers 17 articles with diverse perspectives from leading scholars, researchers and practitioners to examine the current state of non-contributory social protection in the MENA region as a whole and in specific countries, and explore how these countries have been coping with and learning from recent economic and humanitarian crises. The Spanish version of the socialprotection.org online platform has just been launched. This is yet another option to connect you with cross-cutting themes in social protection worldwide. The platform’s features and content are now available in English, French and Spanish. We invite you to register here. By joining, you will be able access a myriad of content related to social protection, connect with fellow colleagues worldwide and learn about upcoming activities, such as the webinar on 26 July titled "Bringing a gender perspective into shock-responsive social protection". Organised by the IPC-IG and the Food and Agriculture Organization of the United Nations (FAO), and hosted by socialprotection.org, this webinar will address issues such as the differences in the exposure and experience of crises-related risks between women and men, gender-specific roles and strategies to cope with emergency situations. The webinar will also discuss how shock-responsive social protection systems can be gender-sensitive. Click here to complete your free registration. We are also pleased to share the Blog post: "Changes in the provision of social protection in MENA since the Arab uprisings", by IPC-IG researcher Charlotte Bilo. She presents a compelling summary of the eponymous webinar hosted by the platform this past June, and organised by the Centre and UNICEF Menaro. You can deepen your knowledge by participating in the discussions promoted by the Online Community on Social Protection in the MENA region. The IPC-IG hosted a new session of its 2018 Seminar Series on 29 June. These events represent an opportunity to share knowledge and promote debates around current issues of the global development and distributive agendas. The Centre received Dr. José Eduardo Malta Sá Brandão, Coordinator of Studies in International Cooperation at Ipea’s Directorate of Studies on Economic Relations and International Policies. He delivered a presentation titled “Measures of cooperation for sustainable development: Official Development Assistance (ODA) x Total Official Support for Sustainable Development (TOSSD)”. Dr. Brandão presented a brief introduction of two methodologies on measuring international cooperation, as well as their history, risks and controversies. You can watch the recording of the session at IPC-IG’s YouTube channel and read the presentation here. IPC-IG Senior Research Coordinator Fabio Veras and Research Consultant Carolina Bloch participated in the second (face-to-face) phase of a capacity development course on the use of poverty analysis in the design, implementation, and monitoring and evaluation of multisectoral policies to achieve Sustainable Development Goals (SDGs) 1 and 2. It took place in capital of Morocco, Rabat, from 25 to 29 June. The third phase of the course will resume in September. Read more about the course here (in French). This course is also being implemented in Panama, where the virtual phase started on 2 July and was hosted on socialprotection.org. The face-to-face phase will take place from 6 to 10 August in Panama City. Read more here (in Spanish) Both courses are part of a UN-UN partnership agreement between the IPC-IG and FAO Rome. The IPC-IG joined a mission to the Angolan cities of Luanda and Damba, from 15 to 30 June, in partnership with UNICEF Angola. This was the third and last mission under the scope of the project held in collaboration with Angola's Ministry of Social Action, Family and the Promotion of Women (MASFAMU) and other national institutions to support the strengthening of social assistance and social protection initiatives, mainly in the areas of monitoring and evaluation. IPC-IG Senior Researcher Alexander Cambraia presented the Centre's proposal for monitoring and evaluating the decentralisation of social services components to UNICEF's Representative in Angola Abubacar Sultan, Deputy Representative Patricia Portela, and the Chief of Social Policy, Glayson Ferrari. Subsequently, Cambraia presented the proposal to MASFAMU's Minister Victória da Conceição, which she considered to be an important contribution to the strengthening of the Angolan project. Mr. Cambraia also participated in a field mission to the city of Damba, to perform a ground-level assessment of the operational work of the local Centre of Social Assistance unit (CAS).